I am about to head over to Egypt for the very first time. While I am there I will be putting on numerous jump rope shows at a festival for over 15,000 people per day. After we finish up there I will be heading back to Cairo where I am scheduled to put on some jump rope workshops over a 4 day period. It should be a great trip and can’t wait to have the opportunity to perform and teach the awesome sport of jump rope! One of the main reasons I started Jump Rope Secrets was to offer a detailed resource to teach and inspire people how to jump rope properly. A big reason that I have invested so much time and energy into the site has been because most people cannot afford to host a series of jump rope workshops where they can learn. Outside of the obvious travel costs (airfare, hotel, food, etc), there is also the instructor fee. Can it be worth it? Absolutely! On top of all the jump rope shows that I perform around the world, I often have people bring me in to teach some jump rope workshops at their venue. I’ve taught at crossfit classes, schools, churches, civic centers, stadiums and more. Which way is the best to go? I thought I would give some advantages that each type offers. The other day I was performing one of my jump rope shows at a fall festival in Alabama. After I finished the show I was selling some jump ropes for anyone that was interested and a little girl was trying to do a criss cross. She was doing something that I often see which is a “shadow cross”. The best way to describe it is when your hands come together like you’re going to do a jump rope criss cross, but you pull your hands apart before actually jumping through the cross. She did this numerous times before I stepped in to give her some tips to make it work. Any good jump rope instructor will be able to evaluate exactly where you are and what you are doing right (and wrong). This evaluation is huge and can save you hours of frustrating time trying to figure out what’s going on. This is probably the biggest advantage of having some jump rope workshops. A good jump rope instructor can be there to break down each skill in a way that fits your particular situation. After they evaluate your skill level, they can give you skills that are perfectly fitted to where you are. They will also give you some jump rope tricks that are a little bit harder so that you can start improving. When things are finished with your jump rope workshops, they can give you a list of skills to keep practicing and what you need to work on next. There are times in life when having someone who knows their stuff to ask a question from in person can be invaluable. A jump rope workshop is the perfect time to ask questions! What is it that you are struggling with? What have you always wanted to learn? You may dream big and ask to do something you’re not ready for, but your instructor can give you a game plan to work on so that you can eventually do that skill. One of my favorite movies is Major Payne (I know, totally ludicrous). I can’t imagine the military is anything like this in real life, but boot camp is a definite reality and drill instructors won’t stand by and let you slack. Some people need the motivation of the drill instructor. If you don’t have the discipline to actually practice on your own, going to jump rope workshops is for you. Most (I can almost say all) jump rope instructors won’t yell at you. We tend to be very supportive and friendly in person and don’t come across like drill instructors. That being said, we will push you to work. We’re giving up our time to teach you and don’t want you to waste your time or ours. Jump Rope is one of the friendliest sports in the world. When you visit a jump rope workshop you will make connections with all sorts of people. Some of the greatest friendships I have were started when I was attending (or teaching) a jump rope workshop somewhere. Your instructors will often be quite busy with their duties, but making friends with other people who are at your same stage of learning is awesome. Even though this may not be the most obvious reason to attend a workshop, this is probably the biggest reason I encourage people to go. I have friends scattered throughout the world that I met at a jump rope workshop somewhere. I hate going to buffets. If I’m going to pay a steep price to have access to as much as I want, I am going to get my money’s worth. I will overeat almost every time. Going to jump rope workshops won’t make you fat (probably the opposite), but there are times where you really need to practice a skill before learning the next one. Because you only have 3 hours (or whatever) with a live instructor, you really want to learn as much as you can during that time. It’s frustrating when you walk away with only a couple new tricks and your goal was to learn 20. 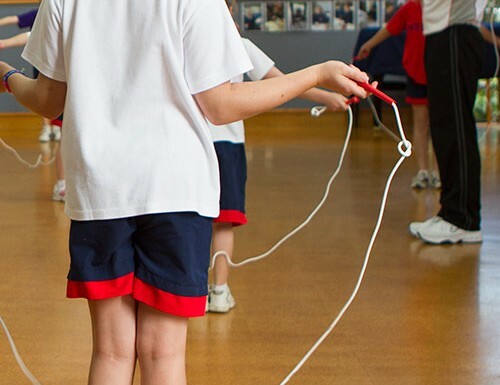 Using a video based jump rope curriculum you can take all the time you want to learn a skill. If it takes you 3 weeks to learn a criss-cross, it’s no big deal. All the other tricks are waiting for you when you’re ready. Most jump rope workshops that you visit will have a set amount of time to work on each type of jump rope they will be covering. Using videos, you can choose to spend 5 minutes on single rope and then 15 minutes on Double Dutch before going back to single rope and then finishing with some Chinese Wheel. You are in the driver’s seat on what you are learning (and how long you spend on it). If you get frustrated because something just isn’t working today, move on to something else. Rope releases can be very frustrating when you are first learning them. You may spend 20-30 minutes on one and still not have it. It can be nice to switch over to something you learn quicker (like footwork) and come back to the rope release tomorrow. If you don’t want to spend any time doing Double Dutch, you don’t have to. You can be very specific on what you are learning. I can’t remember the number of multi-day jump rope workshops that I have taught at where someone could barely walk on day 2. It’s so easy to push yourself on the first couple of days so hard that the rest of the time you are beyond sore. Not a lot of fun. 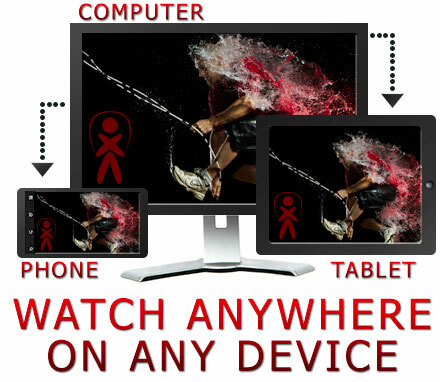 Jump rope videos give you the option to take a day off if you are really sore. If you are having an awesome workout one day and forget to stretch (we’ve all done it), you might decide that pushing yourself the following day might not be the best idea. It’s really lame when you end up sick on the day of the big workshop you want to attend. Do you get embarrassed easily when learning something? Do you hate people watching you mess up? By using a video based jump rope curriculum you can learn whatever you want and nobody has to watch you while you’re practicing. In fact, you could become the greatest jump roper on earth and not have a single person ever know it. When you are using videos to learn how to jump rope, you can practice whenever you want. There is no all-day Saturday commitment if you want to learn. You can spend 5 minutes a day and still have access to the best instructors. We have over 13 hours of detailed, step-by-step instructional jump rope videos here at Jump Rope Secrets. You can learn different styles of jumping from the very basics to advanced and pay a single annual fee. Jump rope workshops are great and I highly recommend you attend at least one, but the biggest disadvantage is the cost. Discussing the costs related to hosting an event is well beyond the scope of this article, but trust me, it’s expensive. If you’re attending a jump rope workshop somewhere, you have to factor in gas, food, entrance fees and your time. We are focused on providing high quality teaching from world champion jump rope instructors. You have full access for a fixed price to learn at your leisure. This is in no way a detailed analysis. There are many intangible benefits that can come from hosting (or attending) jump rope workshops. The most important thing is to get out there and learn how to jump rope!